In COSN’s* first Driving K-12 Innovation Series report, they identified “the gap between technology and pedagogy” as one of the top 5 hurdles districts face in driving innovation. Rapid advances in technology can make it a challenge for teachers to embrace the instructional shifts needed to support improved student outcomes. • Implementing personalized, job-embedded professional learning that meets teachers at their point of need. Cristin and Lauren will share key learnings to help you get the most student learning benefit from your technology investment. Dell Financial Services has an industry-leading portfolio of flexible consumption solutions which allow you to match payments to your actual usage and transform your technology spend. Learn how in this interactive webinar hosted by Mark Mostaffa, Director of Dell Financial Services Cloud Consumption Services. Cloud computing isn't going anywhere. And for many organizations, moving applications, infrastructure, and other IT or business functions makes perfect sense. However, even as cloud computing matures, organizations still have legitimate concerns when it comes to letting go of their own in-house infrastructure, including data archiving, loss of control, and uptime. This session will discuss how IT leaders can strategize when it makes sense to move to the cloud, discuss concerns over security and compliance, determine which workloads stay on-prem vs moving to the cloud, and talk through financial models. With just 8 months to go before Windows 7 support comes to an end (14 January 2020), it is critical for organizations to accelerate their planning for and deployment of Windows 10. We are therefore delighted to invite you to our forthcoming Live Webinar “Build your Readiness Plan for Windows 10 Migration” on Wednesday, May 22nd 2019 at 11:00 am EDT. Join Dell EMC to hear how organizations are successfully transitioning to Windows 10 and experiencing superior security, better performance and the ability to get more things done– all with maximum support and ease of use. At the end of this session you will have a better understanding of the benefits and how to overcome some of the challenges and complexities in preparing a readiness plan for migrating to Windows 10. • Create better services. Bridge the gap between on-premises legacy systems and new cloud to provide students with access to academic resources, learning management, and social networking, while providing new mobile services -- from digital cafeteria checkouts to textbook purchases with a smartphone. • Ensure data quality and consistency across the full student life cycle. Boomi dissolves barriers across enrollment, student records, alumni communications and other processes. • Streamline administration, Modernize legacy environments and liberate data from aging hardware or proprietary applications. Boomi minimizes the inefficiencies of siloed applications and improves access to critical information for staff, faculty and administrators. 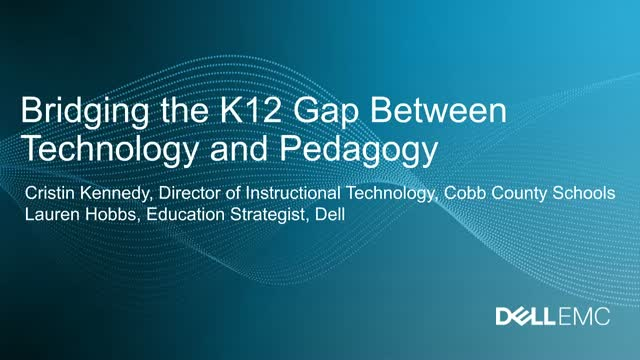 Join us for an in-depth review of three customer examples and a discussion of how Dell Boomi can assist your education institution in delivering the connected campus. The new Dell EMC VxFlex appliance combines the power of Dell EMC PowerEdge servers, with the flexibility and performance of the newly updated VxFlex OS 3.0 in an economical solution. This high-performing HCI appliance offers enhanced life cycle management and automation for your data center. Complex technology initiatives like cloud and virtualization are a growing priority for organizations looking to innovate and decrease time to market. To remain relevant, IT groups need to be agile when introducing new technologies. At the same time, agility must be balanced with budget constraints, the demand for improved productivity, and the need for specialized skill sets. Once new technologies are in place, it’s critical that IT staff be able to take advantage of new features with little or no ramp time. Understanding and implementing best practices to maximize efficiency is key to success. With any new technology, knowledge gaps can exist and need to be addressed. Based on IDC InfoBrief sponsored by Dell Technologies, Accelerating Digital Transformation with Resident Engineers. IDC interviewed Dell EMC customers who have extensive experience with resident engineers, and surveyed 200 CIOs and IT managers to gain insight into how IT organizations are currently using resident engineers. For more information go here or contact your Dell EMC Sales representative. As more users adopt virtualization, Dell EMC’s deep integration with VMware’s user interface becomes more and more important. As customers automate, Dell EMC Data Protection offers automation, governance and compliance for VMware vRealize users with the deepest integration points for your cloud orchestration portal. Dell EMC offers a diverse set of server options to help optimize Medium Businesses and their specific needs. In this Webinar we will review the current PowerEdge portfolio to help you choose the right solution. These will include our rack, tower and modular servers and how Dell EMC differentiates our products from the competition. According to IDC, 92% of organizations have adopted a cloud environment with 64% adopting a multi-cloud approach. With a mix of different clouds, protecting data across workloads while meeting compliance and security requirements is a critical challenge for many organizations. Dell EMC recognizes this challenge and continues to enhance its data protection appliances to help customers mitigate risk and protect their most valuable asset – their data – in multi-cloud environments. In this session, you’ll learn about how Dell EMC’s data protection portfolio addresses the growing challenges of cloud sprawl in multi-cloud environments, and also on other enhancements delivered for mid-sized organizations and performance improvements. You’ll also hear from customers about their experience with Data Domain innovations and enhancements. Your Future Self is Calling, Will You Pick Up? What if you had a crystal ball that could always tell you the right business decision? You’d always be a step ahead of your competition with the right products, better more personalized services, and first to innovate into new spaces. Think it’s impossible? It’s not so farfetched … these insights and many more are hiding in plain sight, in your most valuable asset, your Data Capital. If harvested correctly, your data can be your ticket to better performance and new opportunities that you haven’t even dreamed of. This is where AI comes into play as an advanced technique enabling you to extract the maximum value from your data by helping you find the proverbial needle in the haystack. But to fully take advantage of AI and your data, you need a fundamental mind shift. You’re no longer a retail chain, an auto parts supplier, a financial services company; you’re not even a data analytics company. You need to become a technology company with a data and analytics first mentality. To learn more, please join us for our webinar featuring Dell EMC, NVIDIA, and MasterCard where we’ll delve into the art of the possible with AI. This webinar covers an introductory look into what technology financing and solutions services Dell can offer to you and your business.